Not to be outdone by Fortnite, Respawn is plotting a bunch of new content for Apex Legends Season 1… or so we’ve been told. Beyond the studio’s official channels, there have been countless leaks and alleged intel relating to Apex – so much so, in fact, that Respawn actually addressed the tidal wave of false content earlier this month, when it told players not to believe everything they see on the Internet. Wise words indeed. Be that as it may, there have been instances when an untimely leak has proven to be bang on point. Take Octane, for example. Long before Respawn unveiled details of its Battle Pass and the fleet-footed adrenaline junkie we now know and love, Internet sleuths detected some information relating to Octane and his abilities, all of which turned out to be accurate. With this in mind, we draw your attention to FrozenFroh’s exhaustive infographic. 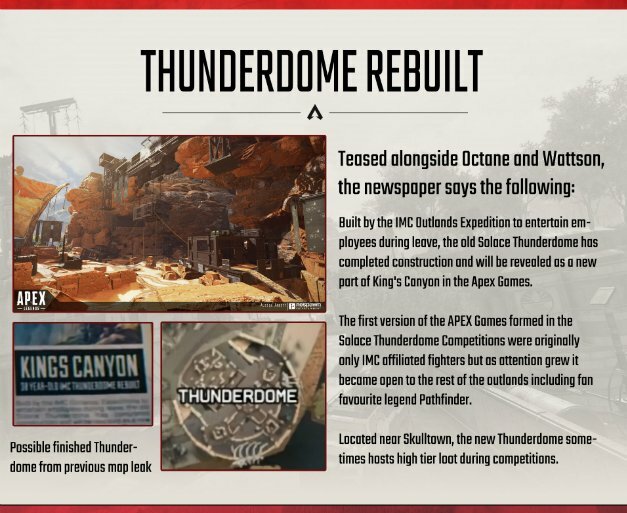 Broken up into sections and embedded below, it’s scoured the four corners of the Internet in search of any content that’s been teased for Apex Legends. 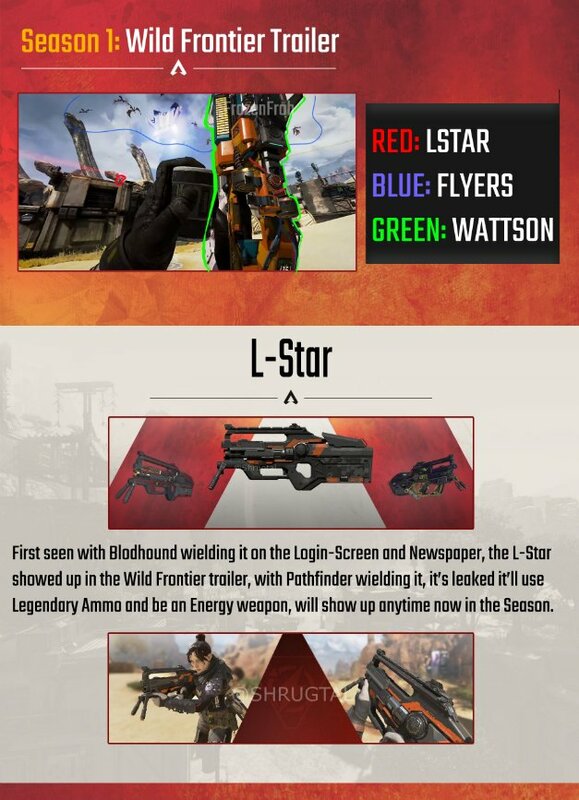 Among the intel detailed above is the long-rumored L-Star weapon, which was initially teased back in February. 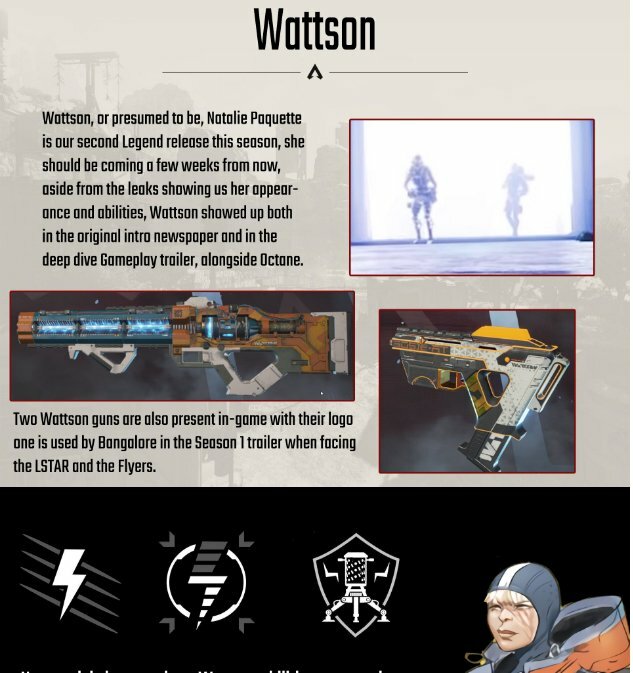 Suffice to say, it’s been a long time coming – ditto for Wattson, a new Legend who cropped up alongside Octane in a recent Apex promo video. That tells us Respawn is on the verge of introducing Wattson to the world. From what we can tell, she’s an electrically-charged character whose guns appear to be able to shoot lightning. Two Wattson guns will also be available in-game, the details of which are being kept under lock and key. If nothing else, this infographic serves as a handy roadmap for all of the many, many Apex Legends leaks, and brings them into some coherent order. Whether they’re actually legitimate will be told in time, but for now, you can share your own thoughts down below.